www.RdBNutrition.com: Orange Juice, What is it Good For? Many people consume orange juice under the misguided impression they are being healthy. However, evidence in the nutritional literature shows that juices are no better than soft drinks when it comes to health. The reason for this is that the sugars in whole fruits are contained within fibrous cell walls, and these must be broken open in order to for absorption to occur. When eaten much of the cell wall fibre remains intact and this delays or inhibits the absorption of the sugars, thus providing a slow release of energy to the blood and liver. 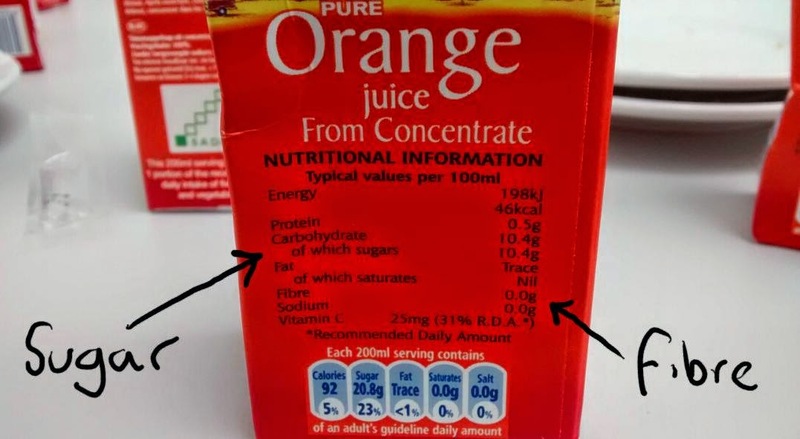 When the fibre is removed as in fruit juice, the sugar more rapidly enters circulation and this produces detrimental health effects by overloading the liver with calories. Much of the sugar is pushed into the de novo lipogenesis pathway and this causes the formation of triglycerides that may contribute to insulin resistance. Fruit juices containing fructose are particularly damaging because fructose can only be processed by the liver and this increases the metabolic damage sustained.